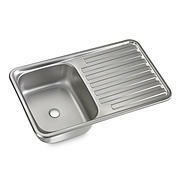 Doing the dishes is a necessary evil. 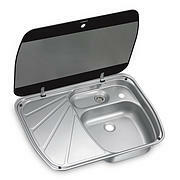 But at least the SMEV sinks help you to make the best of it. 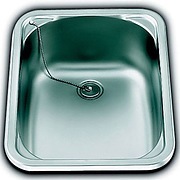 Pick the sink to match your on-board installation conditions. 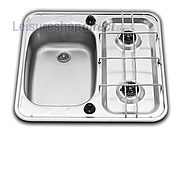 There is something for practically every caravan or motor home owner to enable you to do the washing up comfortably in your caravan or motor home, leisure home owners would all benefit from a SMEV stainless steel sink or SMEV combination uint. 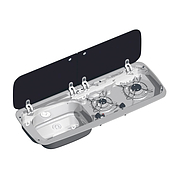 The wide product selection makes it easy to find the optimum solution for your installation needs: round or square in various dimensions, with glass lid, and with drainer, too. 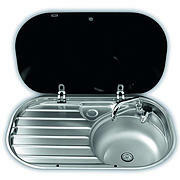 See the SMEV rectangular and square drainers; the SMEV compact square caravan sink is an example of this. 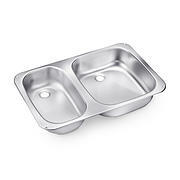 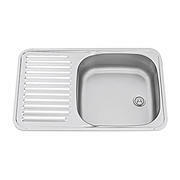 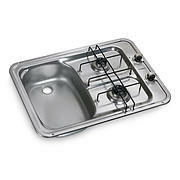 SMEV stainless steel sinks. 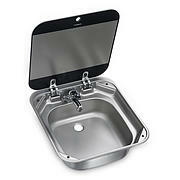 SMEV series 900 sinks come rectangular, square and round so will fit in any van easily. 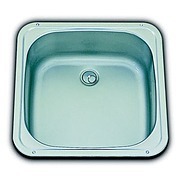 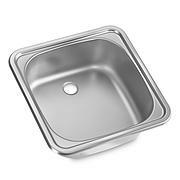 SMEV sinks can come complete with drainer in various sizes SMEV Sink/Drainer and the SMEV stainless steel sinks with lids come in two sizes. 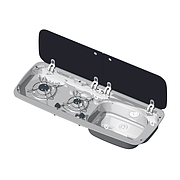 SMEV combination units gives you hobs with sinks and drainer on the left or right hand size, for example the SMEV 2-Burner Combi Unit with Piezo Ignition ,with peizo ignition or electric ignition in many different sizes and dimensions. 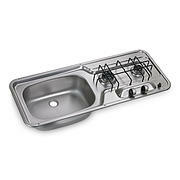 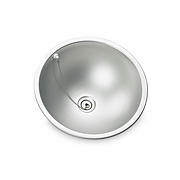 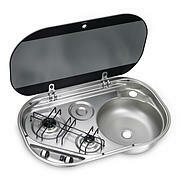 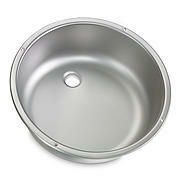 Long-lasting design in sturdy stainless steel. 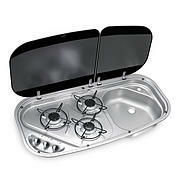 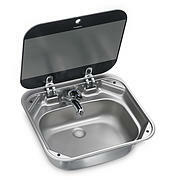 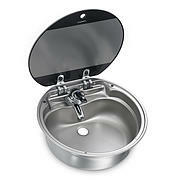 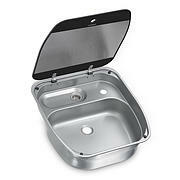 All SMEV sinks are supplied complete with plug hole and rubber seal, taps are not included. 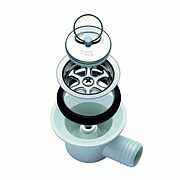 SMEV Waste Fittings with angled waste and straight waste fittings in 20mm or 25mm waste pipe fitting. 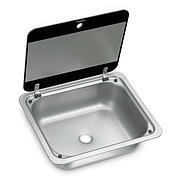 For use with Smev sinks. 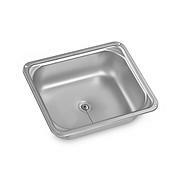 Available as straight, angled or syphon. 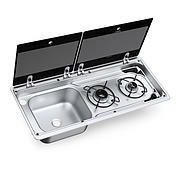 The Dometic MO 9722 is a compact two-burner gas hob and righ or left sided sink combination that brings convenient kitchen facilities to all small spaces. 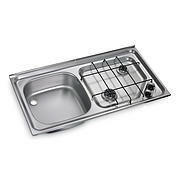 A compact two-burner hob with integrated sink, positioned on right or left side, bringing on-board kitchen facilities to even the smallest of spaces. 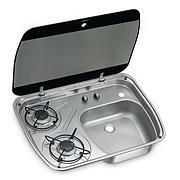 A compact two-burner hob with integrated sink, positioned on left or right side, bringing on-board kitchen facilities to even the smallest of spaces. 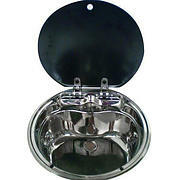 All SMEV sinks & basins come with plug and straight waste.